After residency, Dr. Daniel and his wife, Joan, moved to Burlington, North Carolina to begin private practice. Dr. Daniel practiced in the Burlington community for 21 years and became known for his vasectomy reversal success rate. Initially, Dr. Daniel began offering vasectomy reversal surgery in the hospital as an outpatient procedure. However, the cost of a vasectomy reversal in a hospital setting proved to be very expensive and seemed to be continually rising. Since vasectomy reversal surgery is rarely covered by health insurance policies, vasectomy reversal cost is very important, and having this procedure was out of reach financially for many patients. Dr. Daniel began to research ways to control vasectomy reversal cost and how he could lower the cost of vasectomy reversal surgery without compromising quality. Around the same time, the hospital began using a purchasing contract that limited the quality of the sutures being purchased by the hospital. The instruments being purchased by the hospital were also noted to be in less than perfect condition and of lower quality, as was their surgical microscope. Dr. Daniel happened to meet an older urologist who was performing vasectomy reversals in his office using local anesthesia alone and a surgical microscope. He felt the cost of vasectomy reversal was very important as well. This physician stated that there were very few physicians performing vasectomy reversals in their office and fewer still with proper training. Most of the doctors were not even urologists and many were approaching retirement age. He suggested Dr. Daniel purchase all the equipment himself, so he would have control over the quality of the sutures as well as the equipment. He added: “As long as you don’t charge too much and keep the cost of a vasectomy reversal affordable, God will reward you.” The rest is history. Dr. Daniel spoke with his wife, and decided to invest in the best quality surgical microscope and microsurgical instruments available, installed state of the art LED surgical lighting, and purchased the other equipment necessary to provide vasectomy reversal services in his own facility. All of this allowed for a superior level of quality and patient safety. This also allowed for a significant reduction in the patient's vasectomy reversal cost. Prior to the Daniel’s last child moving out of the house to attend college, Dr. Daniel and his wife decided to relocate the practice and their residence to the location they visited on their honeymoon 30 years prior. Dr. Daniel began construction of a new, state of the art, dedicated vasectomy reversal facility in Bluffton, South Carolina. It was hoped that this would offer easier access to patients, since the office is located right off the I-95 interstate and only a short distance north of the Savannah-Hilton Head airport. In August of 2013, the new Carolina Vasectomy Reversal Center was completed. Dr. Daniel and his wife moved their daughter into the dormitory at college, and subsequently moved to their new home in South Carolina. They are very happy with their decision to relocate to the low country, as are their children who love to come visit. Dr. Daniel's training is second to none. Dr. Daniel has the best university training available to perform these highly specialized procedures. He did not just watch one procedure and start doing them. Training, experience, and meticulous attention to detail are what matter most. Dr. Daniel is able to perform whatever type of surgery you might need to achieve your goals. This cannot be determined prior to your surgery by anyone. If you need a vasoepididymostomy procedure, commonly known as a bypass procedure, he will do it, and for the same price you were told before this decision was made. It is important to be able to offer both procedures; unfortunately, many physicians do not. Dr. Daniel has never encountered a vasectomy that he was not able to successfully put back together. He has the best vasectomy reversal training available, and his results are also second to none. Dr. Daniel began performing this surgery in the hospital over 30 years ago, and later constructed his own facility dedicated to the performance of vasectomy reversal surgery. You would think all doctors start this way, but that is not true. It is actually rare today. Few doctors ever see reversal procedures as part of their training anymore because in a university setting, the cost is just too prohibitive for most people. Dr. Daniel has performed thousands of vasectomy reversal procedures, not just “procedures” as stated on some sites. 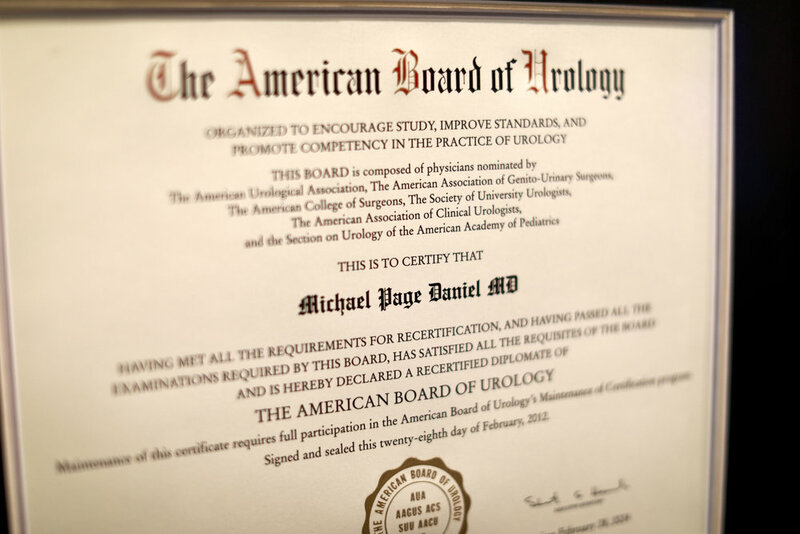 Doctors who are not urologists and who do not have the credentials or certification to be allowed hospital privileges begin in an office with their first procedures. Watching a procedure is not certifiable training. Having your partner “show you how” also really does not count. A one week micro lab rat course is also not sufficient training. We are not making this up! You should be able to tell the training fairly easily on most other physicians websites if you look carefully. Dr. Daniel received seven years of formal university training after medical school as a general surgery resident and as a urology resident, receiving extensive vasectomy reversal surgery. He has over 30 years of experience performing vasectomy reversal procedures. This is the only procedure that he does, and he does it everyday, every week. He feels he is the best vasectomy reversal surgeon anywhere and for good reason.